As Sundays are the day of rest, my husband and I usually do just that, we spend the day walking around Brooklyn exploring new streets, shops, bars and of course restaurants. As we take our Sunday strolls we also come upon some great gems, this time all along Atlantic Avenue in Boerum Hill and Prospect Heights. Starting with the picture to the right, we stumbled upon this really great gardening design shop. It is a really fun shop to peruse. It’s more than a garden center to find plants or small trees but a shop that inspires you to bring more greenery into your life. I love to have fresh flowers in the house but I definitely do not have a green thumb. 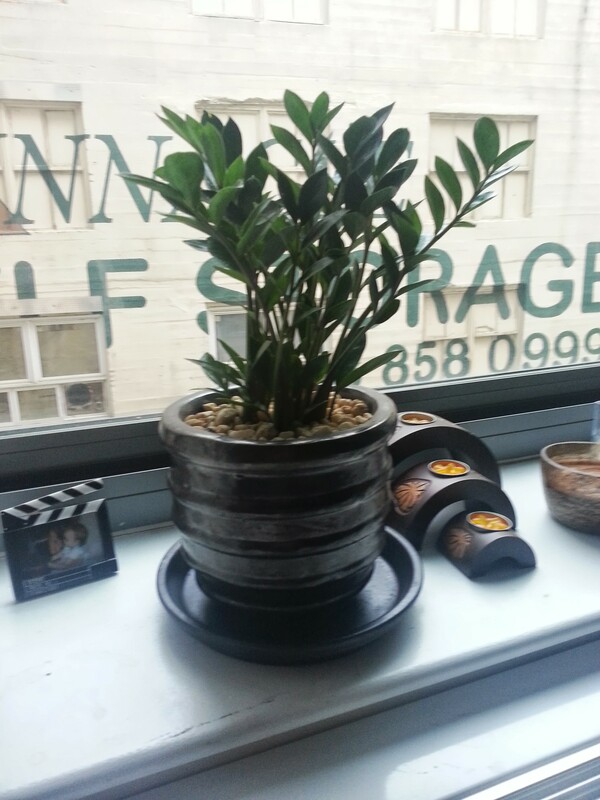 Dig showcases that plants can be fun and colorful and more than just a backyard or an apartment accessory. Dig has unique and contemporary design ideas for any location. It’s a small indoor shop that has a ton of inventory and opens into a backyard with even more. Stop in if you’re passing by, the employees are always helpful and cheerful to talk to. 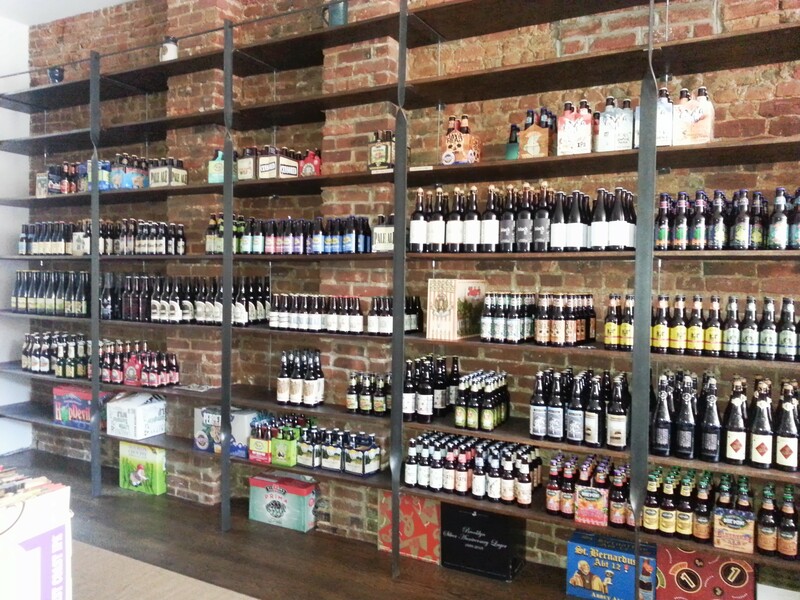 Down the street from Dig, we walked by a recently opened (early August) beer shop called St. Gambrinus Beer Shoppe. Initially what drew me in was the bright open clean space with happy cheerful patrons sitting around a bar showcasing its many beers. As we sat down and explored the menu we then found exactly what sort of jackpot we hit. This “bar” (soon to serve food) has a large variety of beer to choose from. The super friends staff helped us navigate their extensive menu that offers beers from all of the world with drafts served in 3 different sizes and many many bottles to choose from at very reasonable prices. They even offer growlers to take home and you are welcome to bring in your own! 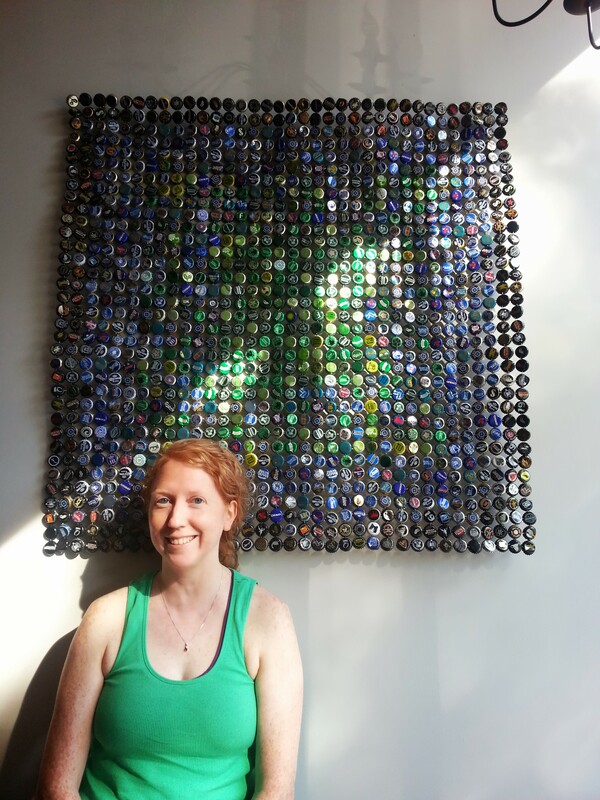 The decor is outfitted by Retto Camme, perfectly illustrating Emma Cotter’s talent of creating beautiful images using beer bottle caps as her base. A perfect space to brand her art and extensive inventory. Check out more of her “upcycled” creations on Etsy! After our soothing aperitif, we finished the day off at our favorite Brooklyn sushi place Taro Sushi on Flatbush. Taro Sushi has fresh fish at also very reasonable prices. 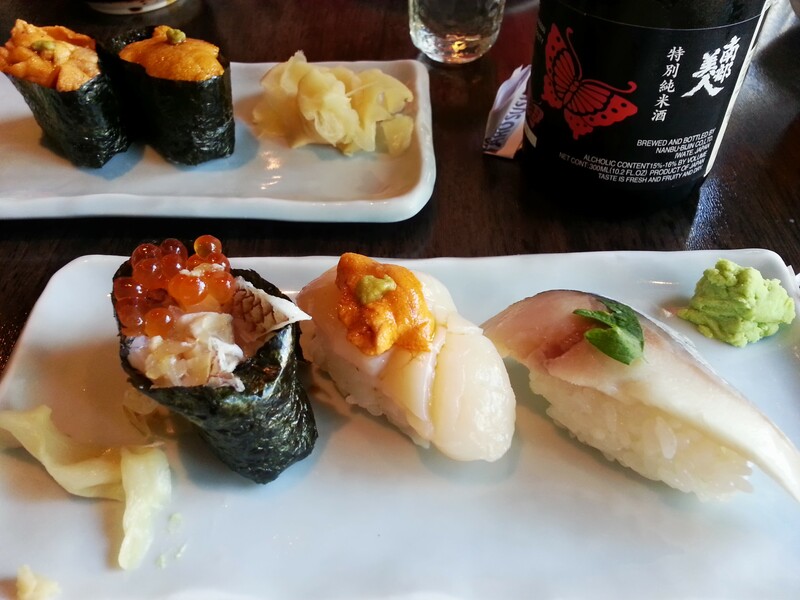 The top dish of 2 different kinds of sea urchin is only $9.50 and the bottom dish of mackerel w/ shiso leaf + red snapper w/salmon roe + scallop w/sea urchin is only $11. They are both amazing from special menu. Although our Sunday may have appeared to be busy, it was very relaxing. It was a great way to end the weekend and we were ready to begin our work week. This entry was posted in good for the mind, body and soul, hungry?, thirsty? and tagged Dig, Emma Cotter, Retto Camme, St. Gambrinus, Taro Sushi. Bookmark the permalink.